the draft final report of the external evaluation that has been running since July 2018 on the implementation of the 2014 Declaration. The outcomes will contribute towards defining priorities, operational modalities and the work programme post-2020. the results of the meetings of the next day (November 13th) i.e. UfM Task Force on Environment and the UfM Climate Change Expert Group. the Non-Paper discussed during the meeting provides the basis for the identification of the priorities to be included in the Ministerial Declaration. It is based on the work of the 2018 meetings of the UfM Task Force on Environment and the UfM Climate Change Expert Group. 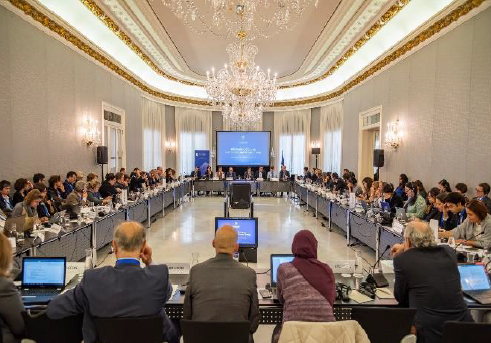 The UfM Secretariat will prepare a Concept Note on the proposed Ministerial that will be submitted to the UfM Senior Officials Meeting in early 2019. A draft preliminary proposal on a future “H2030 Initiative” will be presented at the UfM ENV Task Force that will take place in early 2019. The Task Force will also elaborate the draft Terms of Reference for the UfM Environment Expert Group, to be eventually approved at the 2020 Ministerial.